DIRECTIONS: Renews is located approximately 60 km along Highway 10 south of St. John's. Renews is 10 km south of the town of Ferryland, between the communities of Fermeuse and Cappahayden. Renews can also be accessed by exiting the Trans Canada Highway at Highway 13, the Witless Bay Line and turning south to join Highway 10. 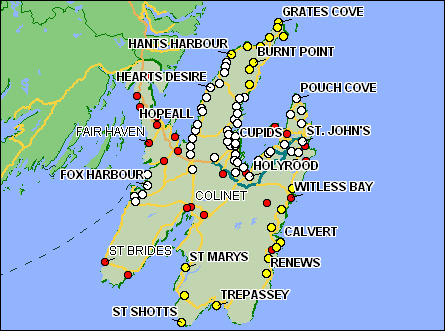 Renews is approximately 1.5 hours drive south of St. John's.